I am not a big fan of snacks but my husband like to eat snacks other then main course. Bajji's (fitters) are one of the favorite snack for him but not mirchi bajji( green chilli fitters). He likes other vegetable bajjis like onion, brinjal, ridge gourd and bottle gourd. My favorite is mirchi bajji's.. I never saw my MIL making bajji's but she makes onion pakodi's so very well. My mother used to make bajjis with almost all vegetables and she make a slit on bajjis and stuff them with chopped onion and coriander leaves .I like that way to eat bajjis. Here to day I made bajjis with bottle gourd but you can make with any other vegetable like potato, onion, brinjal, ridge gourd, raw plantain, green leaves like palak and vamu aaku ( I don't know the name for this leaf in english), cauliflower, baby corn, capsicum. 1. Peal outer skin of bottle gourd ,wash and cut in to rounds make sure that seeds should not be there. If you find seeds cut in to half circles and remove the seeds. 4. 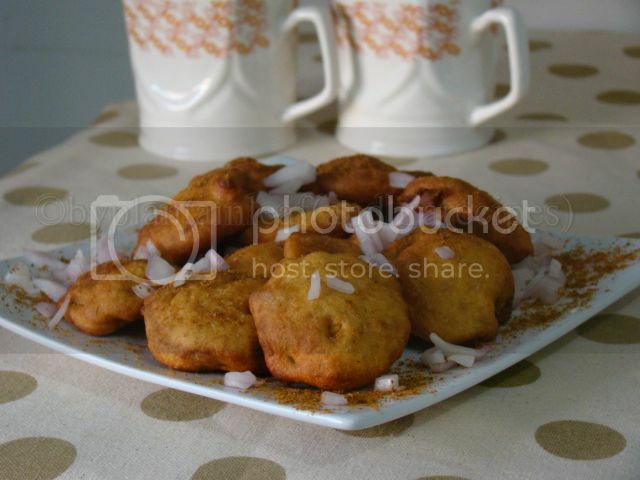 Remove from oil and serve with tomato sauce or green chuteny and also you can serve with dal chaval and this bajji's.